Preheat the oven to 350°F. Line a sheet pan with a Silpat. Stir together the banana, oats, PB powder, and cocoa powder. Drop the mixture into 15 even scoops on the prepared pan. Press each one out flatter and use your fingers to smooth the edges into a circle. 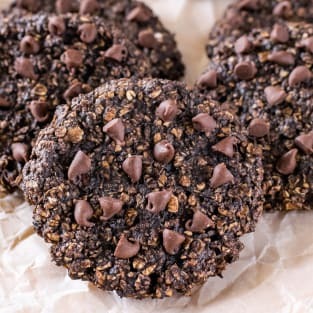 Press a few mini chocolate chips into the tops of the cookies and sprinkle with a little bit of sea salt. Bake for 15 minutes. Remove and let cool.